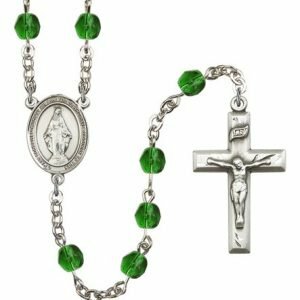 When St. Catherine Laboure was a young, unassuming nun in The Daughters of Charity, she was visited by the Virgin Mary in a series of three miraculous apparitions in 1830, a tumultuous time in French history. A young child, illuminated with an internal light, came to her room on night as she slept in the convent. He escorted her to the chapel where Mary appeared to her standing on the globe. 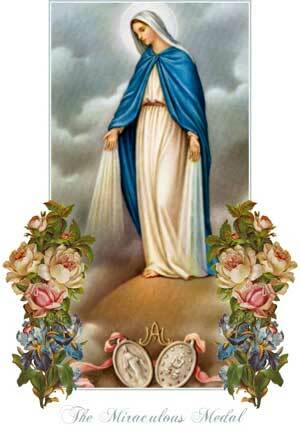 Glorious rays of light emanated from the Mother of God. 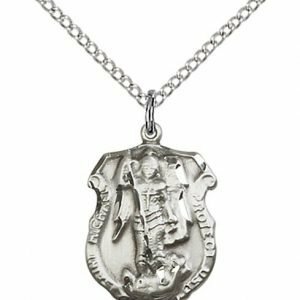 Mary told Catherine to have a medal made. 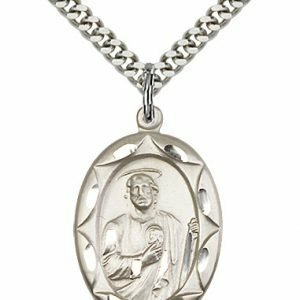 Each person who wore it would receive benefits that would carry them through the upcoming revolution in France, during which the Church itself would be desecrated. 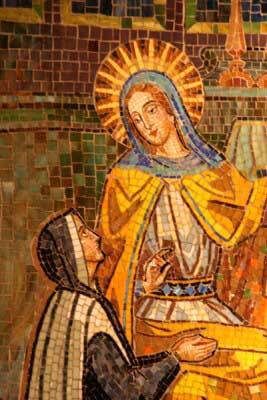 Even though Catherine, still a young postulate, feared being doubted, she did as Mary instructed. 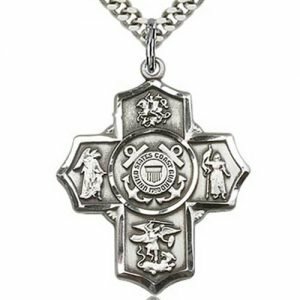 The medal is now known as the Miraculous Medal and it has been known to grant its bearers abundant grace. St. Catherine Laboure is known as the Saint of Humility. She helps the humble when they are asked to do the great and small tasks of their lives. 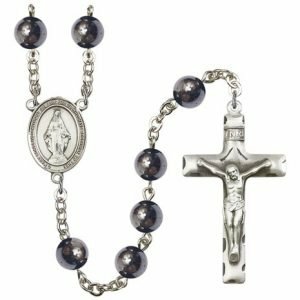 More importantly, what makes it “miraculous?” The simple and beautiful story of St. Catherine Laboure and her Marian apparitions will not only provide the answer, but inspiration. St. Catherine Laboure was born on May 2, 1906, the ninth of eleven children. Her given name was Zoe Laboure, but later when she entered the Daughters of Charity, she took the religious name Catherine. When she was nine years old, her mother died, and it is said that after the burial service, Zoe went to her room, kissed her statue of Our Lady and declared “Now, dear Lady, you are to be my mother.” As a religious sister, she had a great devotion to the founder of the Order, St. Vincent de Paul, and would often pray that he would help her to see the Mother of God with her own eyes. 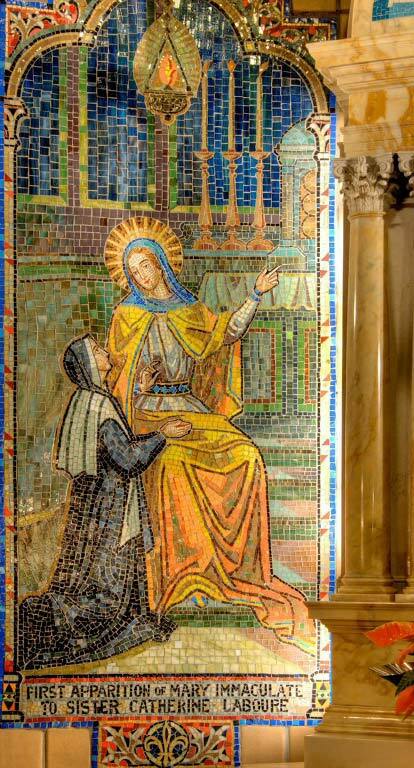 At age 24, on July 19, 1830, St. Catherine was awakened by someone calling her name three times. When she opened her eyes she saw her guardian angel in the form of a child beckoning her to come to the chapel, where the Virgin Mary was waiting for her. 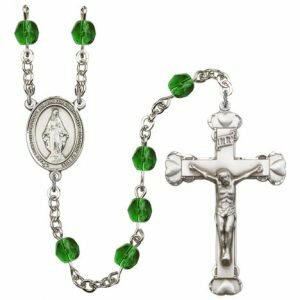 St. Catherine and the Virgin Mary talked together, and St. Catherine was told that she was going to be given a mission from God, and that many difficult times were ahead. Our Lady appeared to St. Catherine a second time, on November 27th, 1830. The Virgin Mary appeared clothed in white, standing atop a globe and holding a golden ball, with rings on her fingers flashing with light. St. Catherine was told the globe represented the whole world, and the flashing lights the graces to be poured out on individuals. 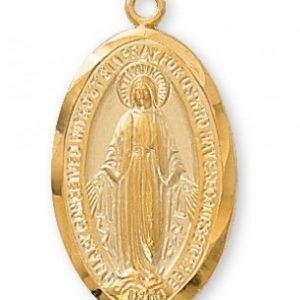 After this, the vision changed to Mary standing in an oval frame, encircled by the letters “O Mary, conceived without sin, pray for us who have recourse to Thee.” The Virgin Mary told St. Catherine to have a medal struck with this image, and that those who wore the medal and said the prayer would receive graces and special protection from her. It took two years before the medal was struck as Our Lady had requested. The medal was originally called the “Medal of the Immaculate Conception” – however, due to the many answered prayers, conversions and cures, it became known as the “Miraculous Medal.” Around ten million medals were made and sold within the first five years of making it available. St. Catherine Laboure died on December 31, 1876. Her body was exhumed fifty-seven years later, and she was found to be completely incorrupt – her eyes still blue as ever. She is still lying in state in Paris, and looks as though she only died yesterday! On July 27, 1947, St. Catherine Laboure was canonized a saint. Her feast day is November 28. 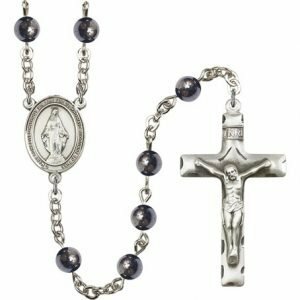 Since her death, the Miraculous Medal has been worn by many who seek the protection of Our Lady. 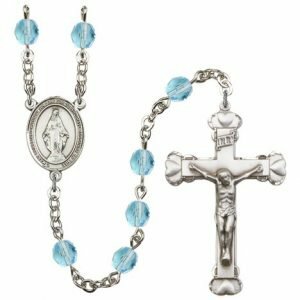 Many healings and answered prayers have been attributed to the wearing of the Miraculous Medal and praying of the prayer inscribed on it. 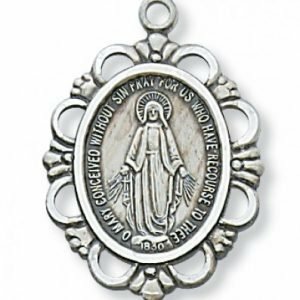 The Miraculous Medal does not have a particular patronage, as it is an image of the Virgin Mary. It can be worn by any person seeking the graces and protection of Our Lady as she promised to St. Catherine Laboure. St. Catherine Laboure is the patroness of architects, miners, and prisoners. 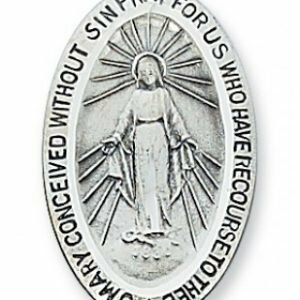 The Miraculous Medal is usually shaped as an oval. 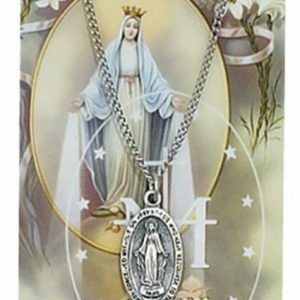 It features the Virgin Mary standing atop a globe with her arms outstretched with rays of light coming from them. 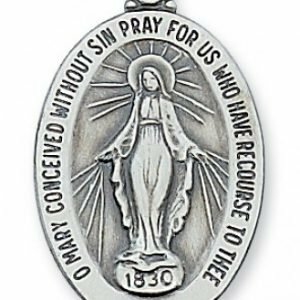 Encircling this image is a prayer, “O Mary, conceived without sin, pray for us who have recourse to Thee.” The back side of the medal shows a circle of twelve stars, with a large letter M surmounted by a cross in the center. Below this are the Immaculate Heart of Mary and the Sacred Heart of Jesus. 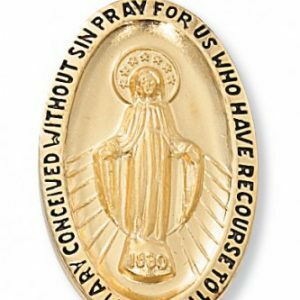 The images on the medal are as seen by St. Catherine Laboure in her apparition of the Blessed Virgin Mary. St. Catherine Labour is often pictured as a young religious sister, wearing the habit of her order. The veil of the Daughters of Charity at the time was called a “cornette” and was large, starched, and outwardly stretching. Another image of St. Catherine Laboure is of her incorrupt body lying in state within a glass case. This is as she truly looks, even today, in the chapel Rue de Boc in Paris, France. 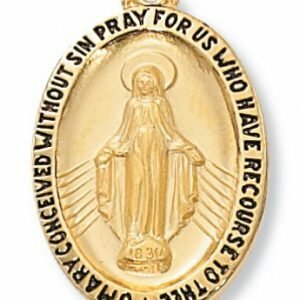 Our Lady of the Miraculous Medal. constant reminder of our filial duties towards you. according to the teaching and example of your Son. the happiness of heaven forever. Amen. Saint Catherine Labouré, you were the chosen confidant of the Blessed Virgin Mary. 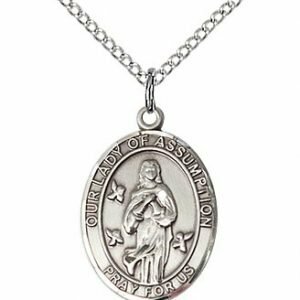 She revealed to you her desire that her children wear the Miraculous Medal as a mark of their love for her and in honor of her Immaculate Conception. Intercede for us, that we may follow our heavenly mother’s desires. Ask that we may receive those special graces which flow from her motherly hands like rays of light. Amen.